Hearts are symbolic of love and affection. 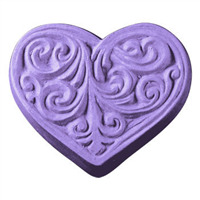 The Hearts Guest Soap Mold is perfect for Valentine’s Day, weddings, and anniversaries. Bar Length: 2.25" Bar Width: 2"
"Love the Milky Way Heart Mold"
COMMENTS: I bought the Milky Way Hearts Mold to make bath Fizzies and Bath Tablets and I really liked the finished product because it looked like I spent a long time crafting my bath fizzies and tables and most of all, the cleaning was super easy! I ordered an additional 5 molds for my product line for next year. COMMENTS: This item is used for both lotion bards and shower steamers. The design looks pretty in either product. 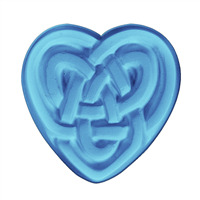 COMMENTS: Love these Celtic heart designs. I bought these to make lotion bars with to fit inside tins. Sturdy and nice detail. Should last for awhile. COMMENTS: I am always needing another heart mold and this just fit the bill. This mold makes beautiful soaps and is great for valentines, weddings, and other occasions. I have used it with a number of products and am very pleased. Also I like working with Milky Way molds. 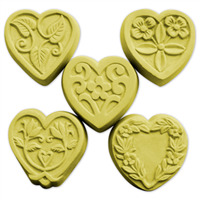 Staff Answer The Hearts Guest Soap Mold (MW 47) consists of 5 heart shaped cavities. Each cavity is approximately 2"L x 2"W x 3/4"D. Each cavity yields an approximate 1.5 oz bar.